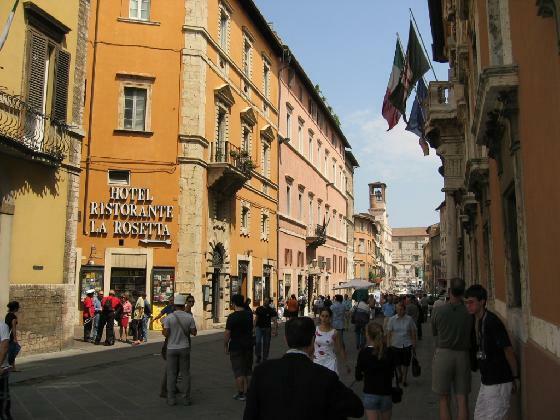 This past weekend Umbra students were put to the test: does Perugia have more nooks, or more crannies? Staff member and Urban Engagement Seminar prof Zachary Nowak took a group of thirty students on a ramble around the city’s historic center, using anecdotes and what Italians call storielle (literally “little stories”) to recount the history of Perugia. Given Nowak’s well-known allergy to “Great Men Building Great Buildings” history, the tour focused instead on social history. Students heard about the orphanage in Via Alunni, all of whose orphans were given the last name “Alunni”…meaning that Perugia’s phonebook is full of this last name. 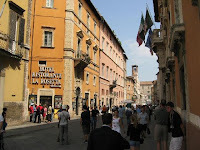 They also visited Perugia’s marketplace and learned about “the Little Sirs of the Ranieri family”, two piglets who provided street-sweeping for the city of Perugia in the Middle Ages. Last stop on the tour? Piazza Felice Cavallotti, named after an Italian politician who died after his thirty-third (and final) duel. The tour was the first in a series of extra-curriculars, the next of which is wine-tasting next week on Thursday.